If you have done any Google searches for t-shirt quilts, you have probably found out that there are all kinds of t-shirt quilt makers out there. How do you choose? Well, let me just say that there is a broad spectrum of people working with tees to make quilts or blankets. However, that is a whole other post topic. I contacted project repat and they wanted me to ship with T-shirt’s already cut up"
My reply was "Heaven's No!" We are a full service t-shirt quilt making company, and we do this full time. Just send us your shirts and we take care of everything. All we ask is that you FOLD the shirts with the side you want us to use. We don't ask you to use tons of masking or painters tape to tell us what you DON"T want, what a waste. If you have any special instructions, just jot a quick note and attach it to the shirt. We can figure it out!! If we do have any questions, we will either call or shoot an email to you to figure out the solution. That being said, over the last 15 years, we have finished up a lot of projects started by well meaning mothers, grandmothers, aunts and friends. We understand that this type of project is actually a complex project if done right. See Who Is Making Your T-Shirt Quilt. 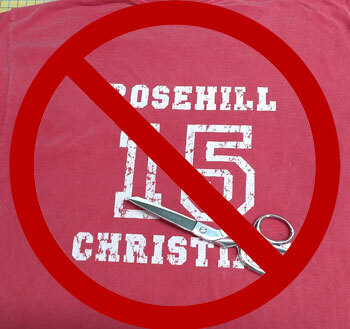 The real reason that we prefer that you NOT pre-cut the shirts for us, is that when we are prepping your shirts, we pre-cut a generous 16.5" square before adding the 100% cotton fusible stabilizer (NOT that stiff polyester stuff). After adding the backing fabric, we center the image with industrial rulers and cut to the appropriate size. We don't cut random size images and spread them all over your quilt in some random manner. When you have a logo on the front of the shirt with big image on the back of the shirt, we can combine (for an additional charge) the two images together into one block, so, in the case of many tees, the date of the event is appliquéd to the big image of the shirt. Makes more sense than having it as a separate small square on the opposite side of the quilt. see Combines. Here are a couple of articles that detail our processes. ** dba is Shadywood Quilts/T-Shirt Quilts of Texas, registered in the state of Texas.